Brighten Up Dark Spaces Instantly! Perfect for Indoors and Outdoors! 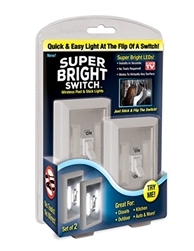 Use Simply Bright Switch to brighten closets, dark pantries, cabinets and much more! Introducing the all new Super Bright Switch that admits a powerful 200 lumens. It attaches in seconds to almost every surface and best of all there's no wiring or difficult installation required! 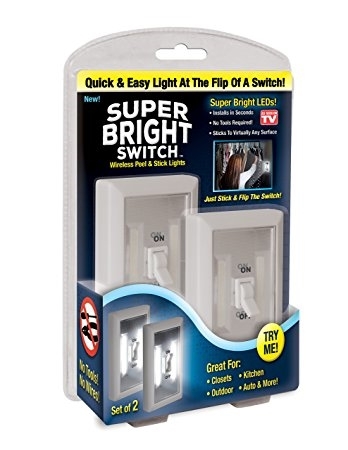 Use Simply Bright Switch to brighten closets, dark pantries, cabinets and much more! The powerful LED lights will stay powered for 60,000 hours. Perfect for outdoor lighting as well. Best of all Super Bright Switch stays cool to the touch so it's perfect for kids as well! Use it when the power goes out or as a handy flashlight! Super Bright Switch has a built in magnet so it will; stick to any metal surface!